Bangladesh with its capital Dhaka is located in Asia (Southern Asia, bordering the Bay of Bengal). It covers some 148,461 square kilometers (slightly larger than Pennsylvania and New Jersey combined) with a population of 157,827,000. Bengali and English are some of the languages spoken by the majority in Bangladesh. Did you know that is sharing borders with India and Myanmar. Bangladesh is in South Asia sometimes converging with Southeast Asia, bordering the Bay of Bengal to the south, mostly surrounded by India. Bangladesh has a sub tropical monsoon climate. The country is primarily a low-lying plain of about 144,000 km2, situated on deltas of large rivers flowing from the Himalayas. Local Bangladeshi buses are generally crowded, often to the extent of people riding on the bus steps (entrance) and sometimes even the roof. The state run Bangladesh Road Transport Corporation  (BRTC) buses usually fall into this category. Avoid all of the low cost buses - they are easy to spot by their poor condition. There are daily fatal accidents involving them. Driving in Bangladesh is not for the faint hearted - the road network is fairly good, but dodging irrational bus drivers and weaving in and out of rickshaws isn't easy on the nerves. Bangladesh as a vacation land has many facets. Her tourist attractions include archaeological sites, historic mosques and monuments, resorts, beaches, picnic spots, forest and wildlife. Bangladesh is a fish lover's paradise. Traditionally most of the country lives off of the once-bountiful fresh-water river fish, especially the officially designated national fish hilsa. Nightlife in Bangladesh is nearly non-existent. Being a Muslim country, alcohol is frowned upon and found mostly in the international clubs and pricier restaurants in Dhaka and in some restaurants in tourist centers like Cox's Bazar. The terrain is mostly flat alluvial plain having hilly in southeast. The average density of population is about 1,063 per km². The climate in Bangladesh can be described as tropicalmild winter (October to March), hot, humid summer (March to June), humid, warm rainy monsoon (June to October). Possible natural disasters include cyclones, droughts and much of the country routinely inundated during the summer monsoon season. To reach someone Bangladesh dial +880 prior to a number. The local cellular networks are operated on 900 MHz, 1800 MHz, 3G, 4G. Websites typically end with the top level domain ".bd". If you want to bring electric appliances (e.g. battery chaarger), keep in min the local 220 V - 50 Hz (plugs: A, C, D, G, K). The sign for the locally used currency Taka is BDT. 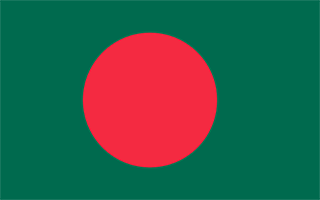 Green field with a large red disk shifted slightly to the hoist side of center; the red disk represents the rising sun and the sacrifice to achieve independence; the green field symbolizes the lush vegetation of Bangladesh. The huge delta region formed at the confluence of the Ganges and Brahmaputra River systems - now referred to as Bangladesh - was a loosely incorporated outpost of various empires centered on the Gangetic plain for much of the first millennium A.D. Muslim conversions and settlement in the region began in the 10th century, primarily from Arab and Persian traders and preachers. Europeans established trading posts in the area in the 16th century. Eventually the area known as Bengal, primarily Hindu in the western section and mostly Muslim in the eastern half, became part of British India. Partition in 1947 resulted in an eastern wing of Pakistan in the Muslim-majority area, which became East Pakistan. Calls for greater autonomy and animosity between the eastern and western wings of Pakistan led to a Bengali independence movement. That movement, led by the Awami League (AL) and supported by India, won the independence war for Bangladesh in 1971. The post-independence AL government faced daunting challenges and in 1975 was overthrown by the military, triggering a series of military coups that resulted in a military-backed government and subsequent creation of the Bangladesh Nationalist Party (BNP) in 1978. That government also ended in a coup in 1981, followed by military-backed rule until democratic elections occurred in 1991. The BNP and AL alternated in power between 1991 and 2013, with the exception of a military-backed, emergency caretaker regime that suspended parliamentary elections planned for January 2007 in an effort to reform the political system and root out corruption. That government returned the country to fully democratic rule in December 2008 with the election of the AL and Prime Minister Sheikh HASINA. In January 2014, the incumbent AL won the national election by an overwhelming majority after the BNP boycotted, extending HASINA's term as prime minister. With the help of international development assistance, Bangladesh has reduced the poverty rate from over half of the population to less than a third, achieved Millennium Development Goals for maternal and child health, and made great progress in food security since independence. The economy has grown at an annual average of about 6% over the last two decades and the country reached World Bank lower-middle income status in 2015.